Exfoliating salmon-colored bark in youth developing into orange-brown after 5-7 years. Leaves are diamond shaped with good yellow autumn color. Predominantly upright habit with fast growth rate. Extremely good for wet areas and damp ground. Flowers inconspicuous April thru May, fruits June thru September. Resistant to both birch borer and leaf miner. Betula nigra (River Birch; also occasionally called Water Birch) is native to the eastern United States from New Hampshire west to southern Minnesota, and south to northern Florida and east Texas. It is commonly found in flood plains and/or swamps. It is a deciduous tree growing to 25 m (80 ft), rarely to 30 m (100 ft), high with a trunk up to 50 cm (2 ft), rarely 150 cm (5 ft), diameter, often with multiple trunks. The bark is variable, usually dark gray-brown to pinkish-brown and scaly, but in some individuals, smooth and creamy pinkish-white, exfoliating in curly papery sheets. The twigs are glabrous or thinly hairy, and odorless when scraped. The leaves are alternate, ovate, 4–8 cm (1.5–3 in) long and 3–6 cm (1.2-2.4 in) broad, with a serrated margin and five to twelve pairs of veins. The flowers are wind-pollinated catkins 3–6 cm (1.2-2.4 in) long, the male catkins pendulous, the female catkins erect. The fruit is unusual among birches in maturing in late spring; it is composed of numerous tiny winged seeds packed between the catkin bracts. While its native habitat is wet ground, it will grow on higher land, and its bark is quite distinctive, making it a favored ornamental tree for landscape use. 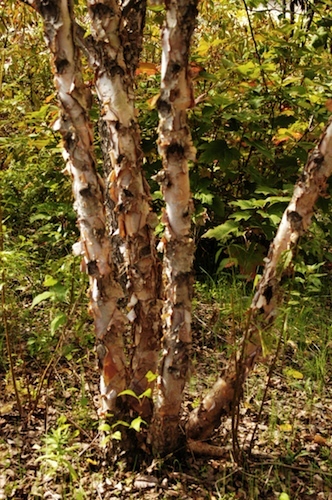 A number of cultivars with much whiter bark than the normal wild type have been selected for garden planting, including 'Heritage' (We have a few of these left) and "Little King"; these are notable as the only white-barked birches resistant to the bronze birch borer Agrilus anxius in warm areas of the southeastern United States of America. Native Americans used the boiled sap as a sweetener similar to maple syrup, and used the inner bark as a survival food. It is usually too contorted and knotty to be of value as a timber tree.